Put a smile on your face each morning when you drink your coffee or tea out of this extra-large 15 oz. photo mug, featuring three of your favorite photos. We’ll transfer three of your photos onto each of these custom photo mugs along with a personalized message. 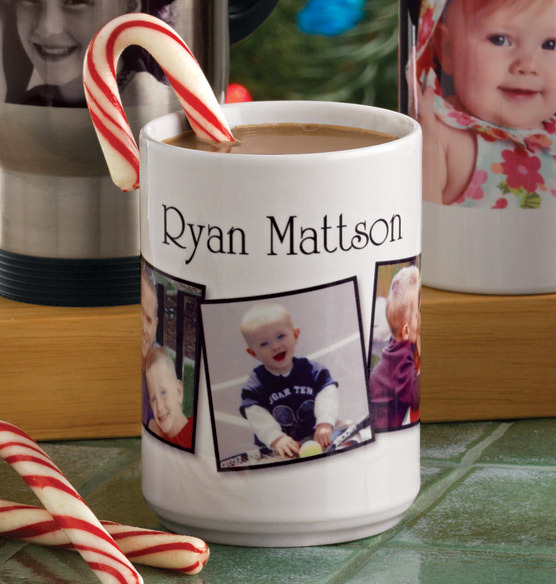 Our photo mug with text makes a wonderful holiday gift, perfect for sharing pictures of children, grandchildren and pets. Got this mug as a gift for my hubby- we were all so happy with it! Great size mug for morning coffee! I was worried that some of the photos were taken with a cell phone and would look grainy- they came out fabulous!!! I ordered this oversized mug as a gift for my teenager. It was fantastic to be able to put 3 special photos on it that she will enjoy seeing each time she uses the cup. Great size, sturdy. I shopped around for personalized mugs at other sites, and most were smaller (8-11 oz) and had only one photo on them. This one is great! Wonder memories mug for you or as a gift. The sale price was an added plus. Very pleased with my purchase. quick easy service, customer service used in past is good. product at depicted.. fast delivery.. all good news. Will use Exposures again. Great price on custom photo mug + free shipping! I think it is a neat, creative and personalized idea that my parents will enjoy. I only wish that it had space for more pictures. Happy memories for an active family, plus, on sale, with free shipping offer. Because my boyfriend loves coffee! What better way to always have me in his hands than in a coffee mug! personalized items make the best gifts! How many washes will the mug last? BEST ANSWER: I haven't washed the mug yet because I bought it as a Christmas gift for my father. However, I think it will definitely last if you hand wash it vs putting it in the dishwasher. I can tell you the quality of the pictures came out great, and I know my dad is going to love it. I gave this mug to my mother last Christmas. It is used often and has not faded. I hand wash them & after a year they show no wear. We love them! how long does it take to receive photo mugs? Are all cups made in the usa mine had made in China sticker on the bottom? BEST ANSWER: Thank you for your question. The Mug is made in China, printed in the USA. We hope this information will be of help to you. My pictures seem to be too small. They print nicely 5x7. Since this is a small item is there a way to use 612x612? BEST ANSWER: Thank you for your question. Photos will need to be the specified size in order to produce the mug. If the pictures are either too big or too small, the photos will not transfer with the highest quality.We hope this information will be of help to you.